Citadelle Gin is half revival, half new innovation: the revival is based on one the first gin produced in France at the “Citadelle.” The innovation is in the where and the how. Maison Ferrand Distillery and the SW corner of France is best known for its Cognac. But perhaps the boldest part was the revelation that during the offseason when they legally couldn’t distill Cognac, they could distill gin. The government finally relented in ’95, and so began the magic of open flames and pot stills: Citadelle Gin was thusly born. The taste begins quietly until the aromatics re-enter the nose. The middle begins with fresh bright juniper, turning more crisp and bold. The finish is what sets Citadelle Gin apart from its peers: really bright, a touch sweet and strongly aromatic: cardamom, angelica, nutmeg, a wide array of baking spices which melds into a more sharp licorice and fennel on the finish. Generally spice forward and slightly contemporary with a juniper base. Nice, but for those of you keeping a historical perspective, this would have been way out there back in 1995. Nowadays we take for granted that a gin can go this direction. But this would have been really unlike nearly anything on an English or American gin shelf at the time. Citadelle Gin and Bombay Sapphire are probably on the short list of those that helped bring gin out of its late 80’s dark ages. Oh Gin and Tonic! It changes the overall perspective of the gin. Instead, we have a bright citrusy body, with a crisp lemon and orange freshness. The spice on the finish has a touch of nutmeg and wet cinnamon. With Kina Tonic, we felt that Citadelle Gin was a touch overpowered here. It didn’t pick up as many of the notes from the gin. The tonic syrup and the gin were both bringing the same flavors and aromas to the picture. So it wasn’t bad, but it begs the question of why Citadelle here? It could have been any other gin. In terms of with tonic, we liked the way it added a touch of the spiced notes to a tonic water, but found it didn’t stand out when paired with a syrup as I think both are introducing the same novel characters to a cocktail. We then pulled out the Gin Fizz, and found it clean and citrusy, but again, I didn’t pick out the gin as brightly here. Good, nice touch of juniper to round out the drink, but again, I didn’t find it as a stand out. Surprising how the sweetness/bitter of the tonic can bring out different notes that just carbonation and lime couldn’t. We went all the way over to the citrus side and picked out a Gimlet. Citrusy up front, with the finish warm and creamy. Vanilla, butter, sweet cream, cinnamon, and even this out-of-place but quite good coconut note at the very end. Overall, quite nice, robust and flavorful. I think this drink really probes beneath the surface citrus and juniper notes and highlights the spicy profile that makes Citadelle unique. 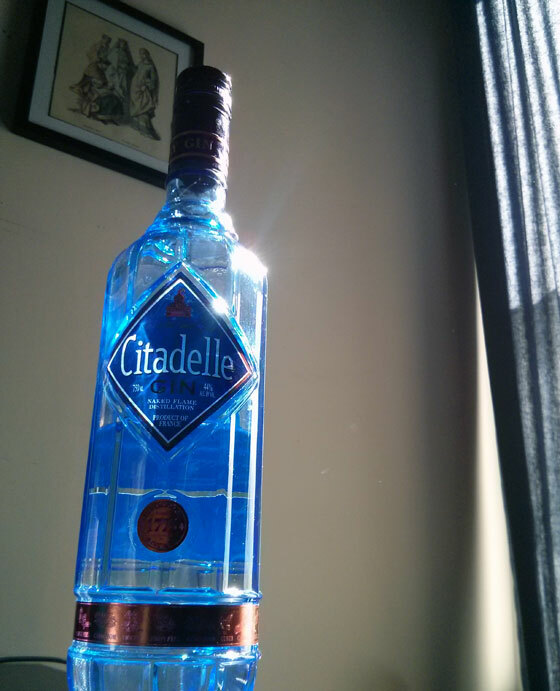 I like a lot of what I tasted in Citadelle Gin. It works really nice on its own, in martinis, or adding complimentary notes to floral cocktails. It does get lost in some drinks though. That being said, fans of the classic style who don’t mind some spice in their finish will likely find a lot of like here. Fans of the contemporary style who like more juniper on their palate will find things to like here as well. It’s a good middle-ground gin that takes cues from both styles, and ultimately, still produces a good gin that is both memorable and well priced.